Kyosho has introduced the second generation of its Outlaw Rampage trophy truck, this time offering it as an almost ready-to-run (ARTR) model with an array of included option parts. The Outlaw Rampage Pro takes the base of the original Outlaw Rampage and 2RSA platform and elevates it with upgraded parts and adjustability. Included with this ARTR model are aluminum-bodied, adjustable shocks with titanium-coated shock shafts, front and rear stabilizing bars, front and rear chassis skid plates, and a selection of chassis refinements. Along with the internal updates, there are some external differences to set this model apart from its predecessor. The grille and headlight design has been adjusted to mimic an 1970’s-style pickup truck. Two grille and headlamp styles are included in the ARTR kit (square and round) for easy customization. Chrome-sytled beadlock wheels and “scale” off-road tires finish off the look of this truck (along with the two spare tires that are mounted in the back of the truck bed). The Kyosho Outlaw Rampage Pro ARTR trophy truck kit is priced around $315.00 and will be available in May 2019 (online and through Kyosho dealers). 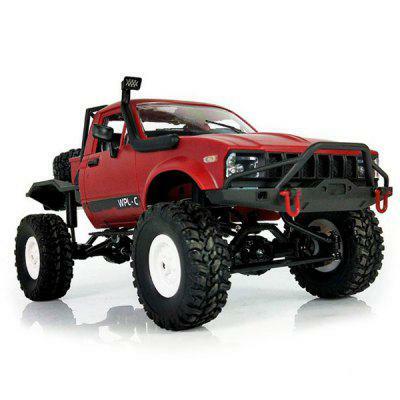 Visit rc.kyosho.com to learn more about this off-road R/C truck.